In this video, Mary shares information about the misconceptions and challenges of getting a mortgage for a condominium. Though it can be more difficult to qualify for a condo mortgage, some of the hurdles are eliminated with a 25% down payment. However, Mary explains that many homebuyers can purchase a condominium with a down payment as low as 5%, if their mortgage broker understands the intricacies of financing a condominium project. 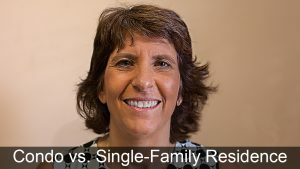 Today, I want to talk a little bit about the difference between financing a condominium versus a single-family residence, because there seems to be a lot of confusion when I talk to borrowers about what exactly are the differences. Some people believe that there isn’t financing available for condominiums, or they think that you need to have a big down payment. That’s actually not the case. There is financing available, and you can even buy a condominium with as low as 5% down for a primary residence. If you’re buying it as a second home or investment property, of course you are going to need to put a little bit more down. But those products are available. The other thing that is a source of confusion is the people don’t realize that there are additional requirements for actually qualifying the condominium project itself. And what that means is, we need to look at the condominium and how they run their operations. Are they collecting their monthly assessments? Do they have the roof in good order and reserves available, if that roof needs to be replaced? And a lot of this is really for the protection of the borrower as well, because you don’t want to buy into a project if you suddenly find out that things haven’t been kept up, and now you’re hit with big assessments. The level of review that’s required on these condominium projects also does vary based on the down payment. So, that could be why some people have the misconception that you need to put a large down payment down. Because if you put down less than 25%, you’re going to go through what’s called a full review of the condominium project. And what that means is they’re going to require a condominium questionnaire. That questionnaire is going to ask all those questions about: Is there any litigation? Are there unpaid assessments? Are the reserves adequate? And that all needs to be qualified in advance. If you put down 25%, your review is much more limited. Well, actually, it’s called a limited review, and it’s really going to focus more on insurance, and does the project have adequate insurance to cover their needs and replacement costs. So, it is possible to get condominiums financed. You can do it with relatively low down payment. And if you work with somebody who really understands the intricacies of financing a condominium project, they know to check a lot of these things upfront, to make sure that you’re not spending money needlessly on appraisals and other things, when maybe the project itself wouldn’t be covered. Also, with an FHA loan, you actually have to verify that that condominium project is on the list of approved condominiums, or you’re not going to be able to get FHA financing for it. If you want more information on financing a condominium project, feel free to give us a call at Marimark Mortgage, 866-910-8020, or visit us online at MarimarkMortgage.com. Thank you.